Uganda is gifted by so many natural and cultural attractions yet undiscovered by many. Let Gorilla trekking be on your bucket list by joining this 3 Days lifetime Gorilla Safari, trek the mountain gorillas in jungles of Bwindi Impenetrable Forest. Bwindi National Park is home to nearly more than half of the remaining mountain gorillas in the world and it is one of the best places to go gorilla trekking in Africa. Uganda has the highest percentage of Mountain Gorillas in the world. There are currently less than 1000 mountain gorillas left in the world and almost half of the population resides in Bwindi Impenetrable National Park. 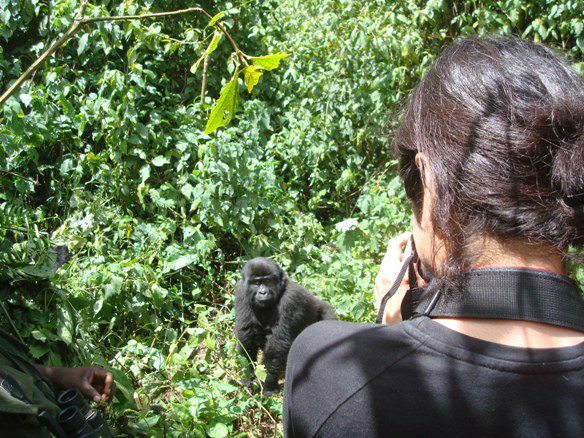 Gorilla trekking is one of the top activities while on a safari. You will visit Igongo cultural center to experience the Ankole culture. Starting from: USD $1890 (Budget Accommodation) | USD $2300 (Mid-range Accommodation) | USD $2900 (Luxury Accommodation) per person based on two travelers sharing. Buhoma lodge situated within the Bwindi National Park, less than five-minutes-walk from the gorilla trekking start point. An elevated lounge area, complete with bar and dining facilities, offers a cozy, comfortable environment in which to discuss the day’s activities around the fireplace. Buhoma lodge has Eight, comfortable cottages each with its own private veranda, offering extensive views of the forest canopy of the National Park. Inside the spacious cottages have comfortable beds, a well-appointed en-suite bathroom with a flushing toilet and a hot shower, some rooms have bathtubs. An elevated lounge area, complete with bar and dining facilities, offers a cozy, comfortable environment in which to discuss the day’s activities around the fireplace. On your arrival, Kubwa Five Safaris representative with your name printed on an A4 paper will welcome you to Uganda at Entebbe International Airport (EBB) and transfer you to Sky Hotel in Kampala, located 10 kilometers from the city center towards Naalya Housing Estate, it has a capacity of 29 rooms with twin beds taking up 58 guests, there is one restaurant, which is open from 07:00 – 10:00 for breakfast. However, it is open for the rest of the day for meals. Relax in your already-booked hotel after a long flight while you are dreaming of your safari tomorrow morning. Depending on your arrival time, relax in your already-booked hotel after a long flight while you are dreaming of your safari tomorrow morning at 7:00am and head towards south western Uganda with a lunch break enroute at Mbarara. Visit Igongo cultural center to experience the Ankole culture before continuing to Bwindi Impenetrable Forest and arrive late evening. Dinner and overnight at Buhoma lodge. Dinner and overnight will be at Red Chilli Rest Camp. After breakfast transfer back to Kampala making a lunch stop enroute at Mbarara. Proceed making another stop at the equator in Masaka; see where this imaginary line divides our planet into two equal hemispheres. Snacks, souvenirs and photographs may be taken here. Arrive in Kampala later that evening and transferred to Entebbe for your departure flight home. Accommodation for tonight is not inclusive in the program. If you wish to depart tonight from Entebbe International Airport (EBB), make sure your flight is at 10:00 or later. If you would like us to book one (or more) nights in Kampala and / or Entebbe, please let Kubwa Five Safaris know. After your breakfast at Sky Hotel Naalya in Kampala, depart to Griffen camp for a zip lining and forest walk. Then head to Ntanda falls for a simple hike at the falls. Activities in Griffen camp and Ntanda falls are; zip lining, forest walks, hiking. Do a city tour before lunch and do other activities after lunch. Activities in Jinja are; the boat ride on the River Nile, bungee jumping, quard bikes, and whitewater rafting. Dinner and overnight at Jinja Nile Resort.